Go back through Insch and cross the railway line and go ½ a mile down towards Leslie. High up in a field on the right is the evocatively-named Wantonwells on Dead Man's Howe. 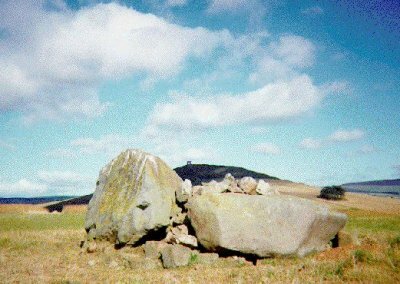 Here only the massive recumbent stone and fallen flanker remain of this circle, but you can ponder on the history behind the placenames.